Hawaiians have a name for them, kanaka makua, the quiet people who live out their lives without fanfare and who do their best to support the efforts of the people around them. The kanaka makua strive to live pono (balanced) lives. They may be ali’i (chiefs) or kahuna (spiritual practitioners) or kumu (teachers and masters of various disciplines). Often they are not. They rarely speak in strident tones and they may not be famous outside their families and circle of friends. People go to the quiet ones for advice and for discreet help and are not disappointed. When the kanaka makua choose to take a stand, the people around them rise up to lend their support. They are deeply honored, these kanaka makua, and when they pass on, their absence is keenly felt. Kahneweiler’s earlier book, THE INTROVERTED LEADER: Building On Your Quiet Strength, published in 2009, was in the forefront of a wave of information about introverts and how they walk through the world. World-change was speeding up then, and the standard in-your-face extrovert tactics were no longer as effective as they once were. Since more than half of the population are NOT naturally into making a lot of noise, the idea percolated up through the mass consciousness that maybe the quiet ones, who are not fueled so much by external stimuli, might have other ways of walking that don’t involve so much pushing and shoving and talking fast and loud. That idea keeps growing, that quiet and effective is a good thing to be. You do not need to be Hawaiian to be a kanaka makua, it seems. Nor does being an inherently quiet sort necessarily mean you are doomed to be relegated to obscurity. The Dalai Lama, a man known to billions of people around the world, certainly qualifies as one. So do people like Mahatma Gandhi, Charles Darwin, Mother Teresa, Nelson Mandela, Abraham Lincoln, Condoleeza Rice, Steven Spielberg, Warren Buffet and Rosa Parks. As former U.S. Secretary of State Madeline Albright pointed out, “One indication of influence is the ability to stand boldly against hostile trends and alter them.” All of these quiet people certainly qualify as influencers. Dr. Kahnweiler is an international speaker and an executive coach who has specialized in developing introverted leaders. By drawing on her experiences to answer the question, she has made a how-to manual for the care, feeding, and handling of yourown introvert nature. Kahneweiler explains what these capabilities are and how you can work on developing them. Then, she also goes into what happens if you OVER-USE them, explaining that when you rely on a strength too much, this can cause you to lose your ability to influence the people around you. Every strength, she points out, can become a weakness if you use it too much – whether you are an introvert or an extrovert. The most interesting aspect of this is that Kahneweiler says she is not a natural introvert. For her, the work she has done over the year has been like living for many years in a country where she is a foreigner. Because of her own extrovert nature, she has been able to see the differences between the two perspective and she is able to compare the effects of having one or the other. Sometimes an ex-pat can see more about how a strange land works than the natives living in it. That ends up sooshing on the sand. Go softly through your days. In a warm and welcoming embrace. On your way to another when. I really enjoyed this read. The facts about kanaka makua was enlightening, just reading about it makes one feel good. I loved the review of the book quiet influence, need to pick one copy. And the poem says it all! Thanks for putting it together in this nice post, good luck to you! Hey Sandy: Thanks for the visit and comments. Please come again…. This book looks like something that I would really enjoy reading. Being a natural introvert myself, I like the idea of being a quite influencer and I love the name kanaka makua. Hey John…thanks for the visit and the comment. Please come again! Hi, I also am an introvert and relate a lot to this article. I enjoyed the references to Hawaiian culture in your article. When you mentioned in the article that every strength can become a weakness, it reminded me of what someone told me a long time ago. I read an article recently where the author was taking the example of a business meeting, that author said that the introverts were busy doing what needed to be done (being effective), and the extroverts were too busy performing (being ineffective). Thanks for your comments and for sharing your thoughts. I can totally get the thing about the meeting where the introverts were busy doing what needed to be done and the extroverts doing a circus. Those kinds of meetings had a lot to do with my choosing to stop being such a groupie. The introverts seem to end up doing all the work. Hmmm…. This seems like a fascinating book. I would call myself an introvert and feel that I communicate very persuasively through writing. I would like to see how to further use my quiet nature to influence others and make a difference in the world. That is why I like to blog. Thanks for the visit and for sharing your thoughts, Eric. I think you’ll like the book. Excellent review! I really like the Hawaiian words and perspective added. I’m an introvert that prefers solitude, but I have anxiety, that when I try hiding it, I talk too much and too fast. So I can appear to be an extrovert if people aren’t aware. It’s a coping mechanism to hide my discomfort. When I used to get really quiet in social situations, mostly because of anxiety and lack of something interesting to say, people would notice and ask me why I was quiet, or jokingly say I was talking too much (when I didn’t speak at all), or ask if I was okay. Talk too much, out of nerves, no one asks if you’re okay. This post reminds me that I wanted to read a few books about introverts, so thank you! Again, love the Hawaiian words added. I love that it’s about respecting the Quiet Ones, too. Excellent! I notice the same thing. I was often considered an extrovert because of my tendency to joke around and act silly when I was uncomfortable. You are right, I think. Nobody asks if you’re okay if you’re in the middle of a nerve-induced performance. I’ve often wondered whether other people have that problem as well. Very interesting article. I am an introvert and when I am around extroverts, it can take several hours, maybe even days to refuel. I think this should be a read for everyone. We need to remember that just because someone is quiet, they aren’t unhappy or rude or upset. They are the watchers of the world. I really loved the poem at the end. I’ll have to read the book. Thanks for your visit and for sharing your thoughts, Tammy. I, too, tend to get peopled-out and can take a day or two to recover from extrovert-overload. This book was a great read for me because it told me that’s just how it is when you’re an introvertish sort. This is an awesome review, Netta. 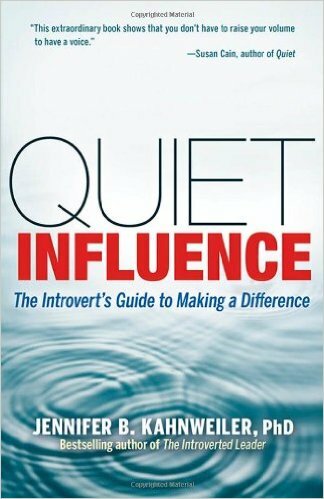 I will definitely be purchasing the QUIET INFLUENCE. I am naturally an introvert but since leaving high school over a year now I have found myself trying a little too hard to be OUTSPOKEN. Simply because I feel it’s an essential part of my journey and the goals I have outlined for myself. This review, however, comes in handy in giving me the assurance I need. Thanks for your visit and for your comments, Shannon. I am really pleased that you like the poem enough to carry it around with you.